Coming from San Francisco, a place where there essentially aren’t any seasons, it’s been an interesting transition living in France, where each season has its own rhythm and distinct feeling. Winter, as you can imagine, is the least favorite season of the year and this past winter was particularly somber and dismal. Parisians refer to the dreary gray days of winter, and the tristesse that accompanies it, an effect of la grisaille. Yet when seasons change here, it usually happens in one day. 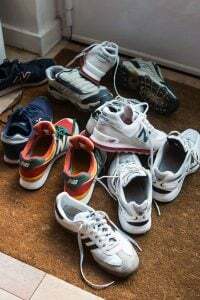 All of the sudden, you find yourself able to open a window and you might head out with just two, instead of seven, layers of clothing. And from that day on, it’ll stay that way until the start of the next season. I was also triste to realize that spring was here and that I was out of ice cream and sorbet; I had neither in my freezer, which is unusual. It’s a bit early for summer fruits and the last batch of pears I got wasn’t exactly stellar. So when I saw these large pink grapefruits at the market, and the vendor told me I could get a free one if I bought six, I was sold. Or I should say, they were sold. Another thing that surprised me when I moved to France is how popular American pink grapefruits are. It kind of struck me as odd that something that was “Made in the USA” was a prominent feature in ads and on signs at the markets. 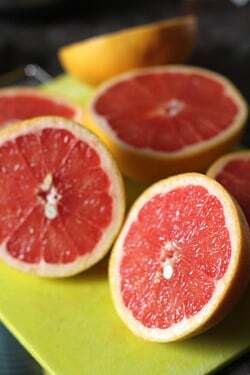 Then I realized something: Pink grapefruits are really good, and are worthy of global recognition. 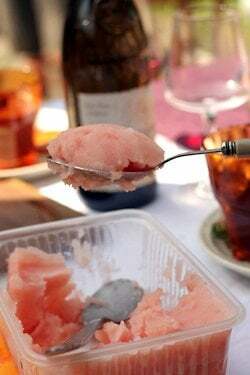 Once home, I squeezed the copious juice out of them (and if there’s anything more satisfying to juice than juice-rich grapefruits, I don’t know what it is) and turned it into a refreshing sorbet with a splash of colorful, tart, Campari. 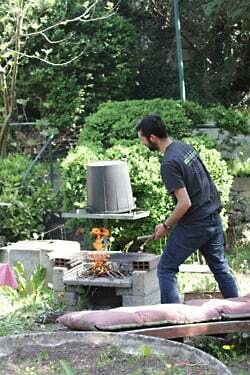 To celebrate being able to be outside without hat, gloves and scarves, I was invited to a bbq in the backyard of some friend’s house just outside of Paris. Parisians are kind of like New Yorkers, who swear up and down that they couldn’t – and wouldn’t – live anywhere else. But once they get outside the city, you can see them visibly relax and all we want to do is to soak in all the fresh air. I must admit that shortly after we arrived, I was thinking how nice it would be to have a yard…and better yet—a grill. 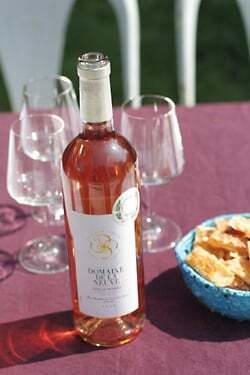 The weather was stellar and our friends had been busy making some beautiful foods, such as prunes wrapped in bacon, which they baked (although if I had gotten there earlier, I would have intervened and grilled them), to accompany the iced bottles of rosé. 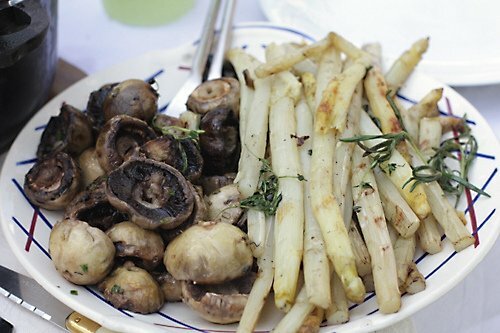 They were boiling a big pot of white asparagus off and had a bag of champignons de Paris (button mushrooms) that were ready for skewering. 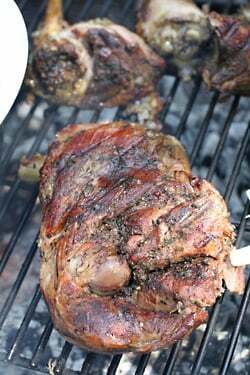 One of the things that we Americans do right is grilling and Romain had braised for a few hours one lamb shoulder and a few shanks, and they were primed to go right on the grill, to pick up additional flavor from the heat and smoke. I could not have been happier enveloped by clouds of grill smoke, and once everyone could wait no longer, we piled all the food on plates and gathered around the table. 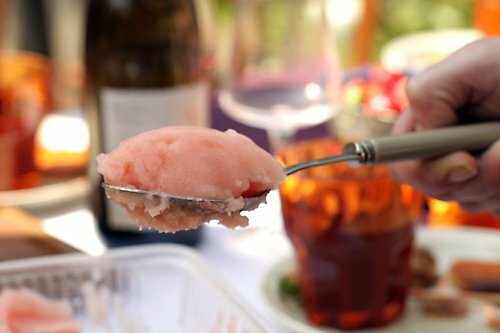 The meal was a big success, and the frosty Grapefruit-Campari Sorbet was just right after such a hearty meal in the sunshine. One of the hosts had made chocolate mousse, and I made chocolate chip cookies, so no one was lacking for desserts. And after several hours of eating, when it was finally time to leave at the end of the day, I looked back and saw what else no one had been lacking for. Grapefruit pairs well with slightly bitter Campari and the little bit of alcohol helps keep it scoopable after it’s frozen. If you want to omit it, or substitute another alcohol, you can. And check out Tips to Keep Homemade Ice Cream Softer for alternative ideas. This recipe would also work with orange juice, too. 1. Warm about 1 cup (250ml) of the grapefruit juice with the sugar over low heat, stirring, just until the sugar is dissolved. 2. Remove from heat and stir it into the rest of the grapefruit juice. Mix in the Campari. 3. Chill mixture thoroughly, then freeze in your ice cream machine according to the manufacturer’s directions. Wow, that looks refreshing. Thanks for sharing! Those bacon wrapped dates look heavenly! I guess I’m feeling sorry for myself (and my fellow New Englanders) because it looks like spring or summer almost everywhere else in cyberland and it feels very much more like winter here. I guess I will have to comfort myself with this grapefruit sorbet–because it looks beautiful, because I love grapefruit and because (little known fact) northerners are the biggest consumers of ice cream no matter what the weather. Thanks for the bonne idee, David. I can’t wait till it warms up enough here to have a bbq outside! We had 3 cm of snow this weekend!! It’s mostly melted already, but still! That pink grapefruit sorbet looks luscious, I’m definitely going to try it! Pink grapefruits are regulars in our fruit basket, too. We love the sweetish-bitter taste of them. The juice plus some honey makes for a healthy kick-starter. Reading your post found me nod a lot. The way seasons change and everyone get’s excited about it, how certain city-dwellers (same here in Berlin) just can’t imagine to live anywhere else on the planet and how good it feels to be outdoors in great company with tasty food… Wish I was there. I’ve never tried Campari with grapefruit. Looks refreshing and tart – which I love! I do not own an ice cream maker but I will save this recipe because one day I just might ! How fabulous this would be for a summer’s evening. Perfect and refreshing! The grapefruit-campari granita looks so refreshing! 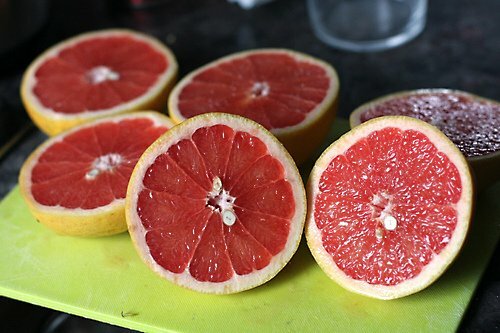 I didn’t read a lick of this post, but your vibrant grapefruit photos are lovely. My mom and I share grapefruits. She has a habit of eating ALMOST all of her half, then leaving the remaining few sections sitting around all day. She’ll sometimes even refrigerate it. Haha. “Too much flavor”? Is there such a thing? 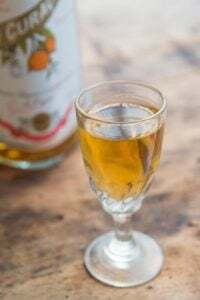 My high school French was (cough, cough) many, many years ago, but I think I recall the word for grapefruit was the pretty fantastic-sounding “pamplemousse.” And, I think you’re on to something: the only thing better than a nice, juicy pamplemousse would be to add Campari and freeze it. It’s still too chilly here in Boston to grill and enjoy sorbet the way it should be enjoyed, but this one is definitely getting bookmarked for once we get some sun. Sorbet looks amazing. Reminds me of when my sister and I were visiting Versailles. After we had walked the entire length of the Grand Canal we stopped at the end were an ice cream cart was stationed. We both got sorbets on that hot, early summer Parisian day. Wow. I am looking at those lamb shoulder shanks! Yum Yum Yum! only a french person could tell you it would add too much flavour! Yum! Excellent timing for this post :: I just ate at Craige On Main in Cambridge MA last week and they served this same sorbet in their tasting menu. They added champagne foam on the top….yummm. 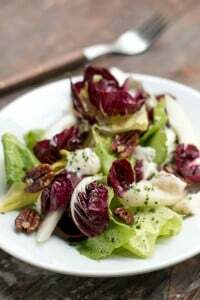 Now, armed with a recipe, I anticipate this becoming a spring staple at my house! 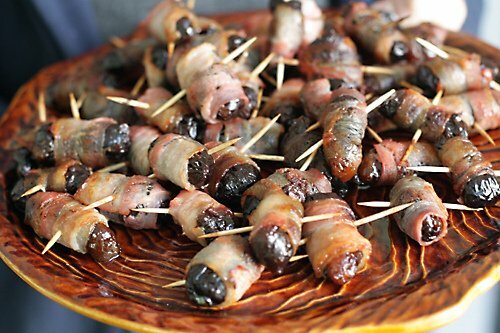 That feast looks great, especially the roast lamb and these yummy bacon wrapped prunes. Are they Angels or Devils on horseback, I can never remember. Glad to see that there was someone there who appreciated good whisky! Bowmore is a classic Islay malt. Oh thank-you! As one of those New Yorkers moved to actually some quite wooded suburbs (we do bears out my way) I totally got what you were saying. Hence the move. We are mere days away from the “we can count on grilling” every night and down by the lake cocktails and hors d’oeuvres that inevitably lead to no need for dinner! Almost, but not quite ready for the Rose. We haven’t packed in the winter jackets quite yet. I am totally seeing this sorbet featured in all of these evenings!!! I am so glad you threw those asparagus on the grill. Probably my favorite spring vegetable treat is grilled asparagus – usually with olive oil, a little red wine vinegar, and some good salt. That sorbet looks beautiful in the color alone and is making my mouth water. Bet that is terrific on a hot day. 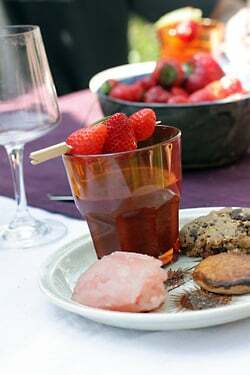 Barbecued meats and veggies, chocolate for dessert, rose on ice. . .sounds wonderful. Give in to the grill David! Oooh that looks pretty! I’m not into alcohol so will put something else in when I make it. Hubby went to a car boot sale a couple of months ago, and came back with an ice cream machine, one that has a freezer built in, Italian brand, for under €20! Having tried it out, it works still, although an old model. I just wish I had the space to keep it out in the kitchen, rather than the basement! And since I live here, I don’t have (and don’t have room for) an ice cream machine, so is there an alternative way to make it sans machine? Because as fresh, light, and lovely as the sorbet may be, you wouldn’t have felt complete without offering a proper cookie. Such wonderful photos – and what looks like a beautiful sorbet! Us Australians also love throwing things on the barbeque (grill) it’s such a fantastic way to cook food. 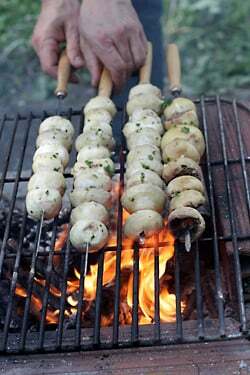 I love the idea of big skewers of mushrooms – yummm. I love prunes in bacon, they’re a staple on our bbq menu; sometimes I stuff them with goat’s cheese. The sorbet looks great, it must be time to dust off the ice cream maker and make some room in the freezer! Campari always makes me feel so Hemingway-era glamorous. But putting it in sorbet? Oh, wow. Thanks for this fantastic recipe, David! Now that spring has finally sprung in Paris, I’m eager to dust off our ice cream maker (one of the best things we’ve ever purchased!) and make some nice sorbets and light ice creams. This one sounds refreshing and delicious, especially since I recently got over my Campari aversion. Thanks for sharing! Although looking from these pictures, I’m willing to give it a try, they look gorgeous. Glad you had fun, the weather looks wonderful for a barbie. Sounds so refreshing! Could Aperol be substituted for the Campari? What a FAB meal, expecially with your grilled additions plus the refreshing sorbet! I “thought” I wanted a break from six months of winter and citrus. I “thought” wrong and will be scooping up the ruby-red grapefruits that still abound. It will be the perfect accompaniment to the 4 inches of snow that is coming our way. Could you provide some advice on getting something with Campari (or other alcohol) to freeze completely? I tried making some orange-Campari popsicles last summer and, while delicious, they were a bit mushy. I make bacon-wrapped prunes as my go-to quick dish for brunches. Folks (under the age of 70, anyways) are always “ew, prunes!” but then scarf them down. Do they still call them “devils on horseback” in France? summer roll on… :) thanks for this first outdoor meal, many will follow! and sorbet au grapefruit with Campari is delicious too. LOVE THAT bbq pixie – hazy, warm, you can feel the sunshine, the heat, smell the ‘perfumes’ – love particularly the ‘real’ fires with wood-charcoal if possible…. Hillary: Alcohol doesn’t freeze you the best thing you can try is to cook it to ‘burn off’ the alcohol, by boiling it for a few minutes. You can also dial the sugar way down as well. 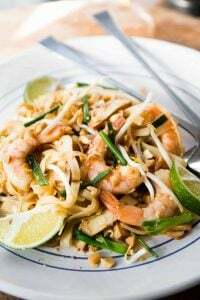 Francesca: As mentioned in the headnote to the recipe, you can substitute another alcohol. 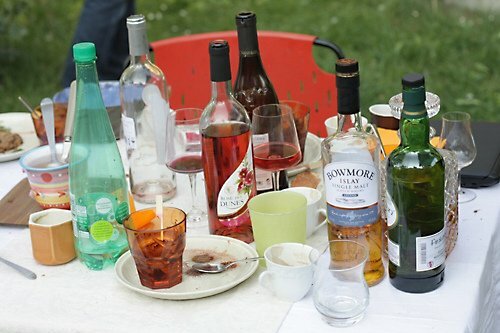 If you try Aperol, let us know how it turns out! 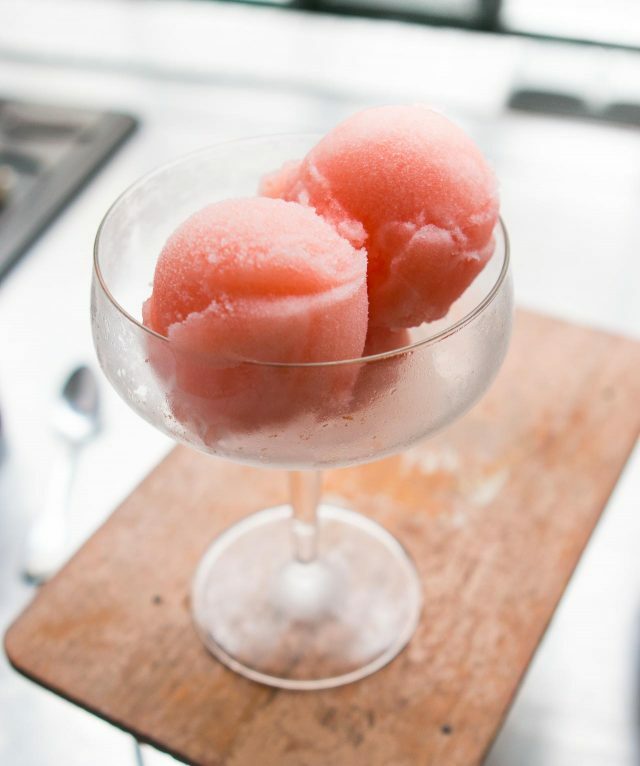 I love the idea of pink grapefruit and campari sorbet. I’m going to try this as a granita since I stupidly put our ice-cream maker in storage when we started serving overseas 6 years ago. Campari is my drink of choice. Living in Italy and having to abstain from it (as a nursing mother) has been a cruel form of torture! I’ve never had bacon wrapped prunes…are they reffered to as Angels on Horseback? I will try them for my 1st bar-b-q of the year or if I can’t wait, I may try them in the oven. I guess I just cook them till the bacon is slightly crisp? I always say I keep returning to your posts because of your fabulous writing… which is true… but your photos are truely out of this world. Really good, David. Really speical. I love it all! Thank you so much for blogging… it’s always such a pleasure to read your posts! :) I really enjoy this post David . believe me David, I’m working to change that too with my family here (I’m english and live in Normandie with my french fiance)! Speaking of lots of flavour, I wish I could find more great spicy food here! If you have any recommendations in my area, do let me know! 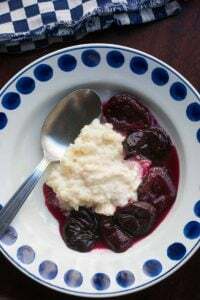 It never dawned on me to make my own sorbet, and your recipe looks so good and so simple I want to slap myself upside the head for not trying it sooner. I recently read that grapefruit pairs well w/ white chocolate; I used to detest the cloying tasteless white stuff til I tried the real thing w/ at least 30% cocoa butter. Perhaps I’ll make the sorbet and serve in white chocolate shells? I have a backyard, David. You are welcome to come grill anything, anytime. And I live in California. San Francisco. Right now it is over-cast and drizzling. Remember? I have a question about transporting ice-cream and other frozen goodies. How do you do it? I’ve tried carrying ice-cream in a styrofoam chest (with lots of ice) to Sausalito — a thirty minute trip — and when I arrive, well, it’s no longer frozen. Help! I’ve just started eating pink grapefruits with a bit of local honey drizzled across the top as my daily snack…and now onto making some sorbet! Fabulous. Thanks! It’s 9:21 pm, and the temperature has dropped, to 80º. We took the comforter off four days ago, because it was finally over 65º during the night. I’ve been mulling through the sorbets in your book, and checking the herbs in my tiny yard – I don’t have grapefruit growing here, but I know someone in Plaquemines Parish. I did make the mint ice cream last week, but it’s already too hot for cream. Thanks for the recipe. 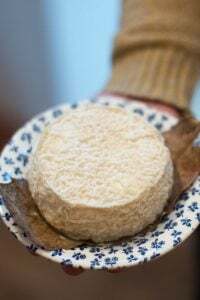 Marie: I use an isothermic (insulated) sack, which they sell at most supermarkets and frozen food stores here in France, and you can transport frozen foods for at least 30 minutes in them. (I add an ice pack just to make sure!) In the US, they sell similar bags for carrying lunches around. Zac designs makes these Insulated Ice Cream Containers with freezable gel inside which they claim “keeps the contents chilled for up to 90 minutes.” I haven’t tried one – (they’re one of those “European products” that don’t seem to be available in Europe!) – but that might be your solution. Hi David! I’m totally hooked on to your blog, just love your writing…..you make want to eat, cook, bake and you make me laugh!! Ok I have a question for you….I don’t have an ice-cream maker, so I end up beating the ice-cream mixture by hand. Should I be doing the same for a sorbet to keep it smooth? 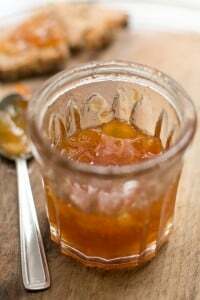 At the end of the post, right beneath the recipe, there is a list of related links. The second one is a link to a post I did on How to Make Ice Cream Without a Machine. We used to pay a premium price for grapefruit-campari sorbet from the specialty store, until we got our own ice cream maker. 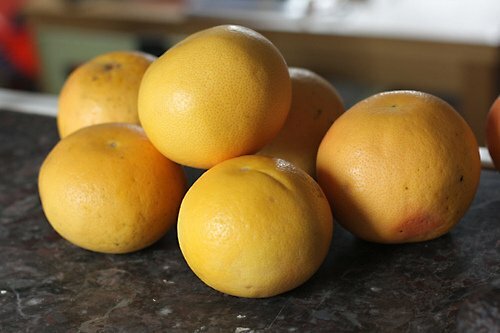 Now, come April or May when we realize we still have a few grapefruit left from the holiday-season-music-department-Florida-citrus-fundraiser, we go to town making sorbet. And since our cupboard is never without a bottle of Campari…….it’s so refreshing and never fails to impress our guests. 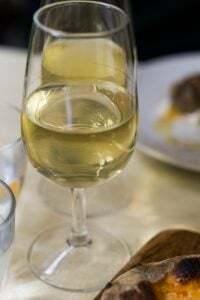 Sometimes we serve it as a palate refresher between courses, in mini French picardie tumblers. What an enjoyable post! I am now craving for a barbeque party. I love this blog. I love the text. I love the photos. 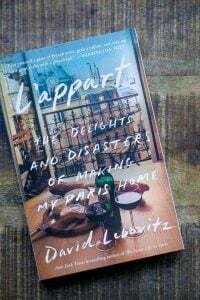 (…and France, Paris, and a man called David – mine, not Mr. Lebovitz, not that he’s not really wonderful). Anyway, what has happened to the photos? They have gone away. For some weeks now there have been no photos on the posts. I know others can see them since they write comments such as “yummmmmm…those bacon wrapped prunes look delish! !” or something to that effect. It’s probably my fault as I’m a technophobe disaster area, but I’d be very grateful for a suggestion/explanation. I usually make this sorbet with a Cordon Bleu recipe, is an excellent excellent and powerful combination. I loved reading this post and want to make everything in it! I cannot stop looking at the picture of that grill – it looks so cool with the wood fire on the slab, and the low grate. Do you know if it was hand made? I love my Weber, but would love to build (or who am I kidding – hire someone to build) something like that. Hi David – Such a happy post. Love the spring-like colors in all the photos. Too much flavor, no comprendo! Wishing you a wonderful Passover too. Trop de gout?! Those are gorgeous grapefruit photos, and a lovely way to enjoy them. As a fogged in San Franciscan, I understand your innate thrill of the grill. There is nothing we don’t throw on the grill here, including whatever fruit is around, like the sugar prunes on the trees in our backyard. And as you know, rosemary grows like a weed around here. One of my summer favorites is to skewer figs on rosemary sprigs, toss them in a little olive oil and sea salt– and grill them. Hope I haven’t made you too homesick. Would kirsch work instead of campari? Or would it be better to just sub in OJ like you suggested? 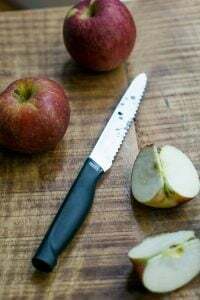 Nicole: I would be wary of putting that much kirsch in sorbet as it might not freeze – and I think the flavor would be rather strong. I’d try half the amount. Bowmore! First scotch I bought (well, and only, to this point). Good stuff for the price point. Since you are such a foodie, thought you may like to visit them all for us! It was a boast in the spanish paper as Spain has three! 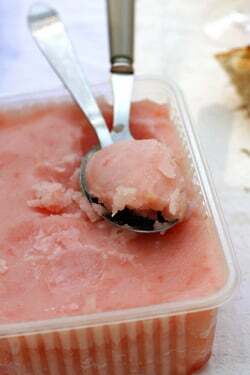 I just finished off some pink grapefruit-tarragon sorbet that was in the freezer. That’s a really nice combo, too–very refreshing. It’s for a summer story. I suggested adding a little pom juice or cranberry juice to boost the color–so it looked a lot like yours. I think that grapefruit sorbet might actually be my fave, though I once had some passion fruit that was totally amazing. Then again blackberry is nice, and lemon, and …. Amazing info…and your pictures looks like waiting to be enjoyed. Kudo’s to Romain! 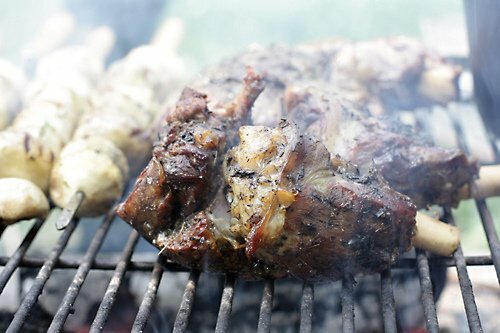 I think the braised and grilled lamb is a great idea – I would never have thought of bbq’ing those cuts, and this has opened up a whole world of ideas for me now! For the love of God, boiled asparagus? Why?? I have made something similar I made up called Negroni ice pops. Grapefruit, campari, a bit of gin and a bit of Punt e Mes (sweet vermouth can substitute but isn’t as good) Put them in ice pop forms. Be careful not to add too much gin or they don’t freeze well. will link to blab bla and encourage my visitors to by your book if they liked your recipes.